Mary Ann Bodine Al-Sharif speaks during Coffee and Race presentation. 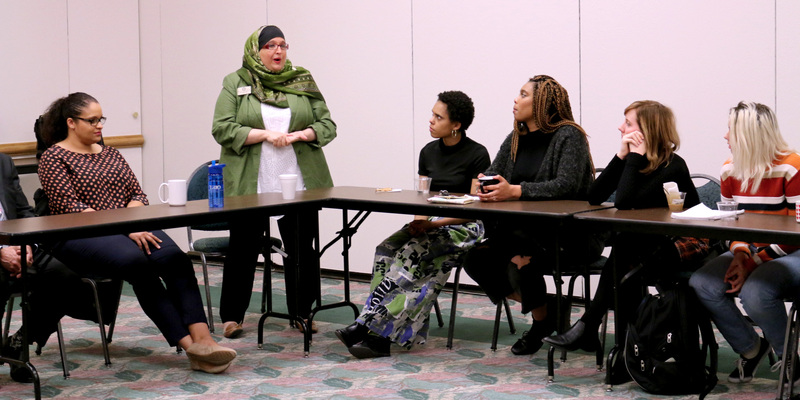 On Thursday Oklahoma City Community College students and faculty met at an event called Coffee and Race to discuss racial issues. Three panelists, Mary Ann Bodine Al-Sharif, Amanda Finch, and Steven Swinford, spoke about their experience. One of the leading topics brought up was the prevalence of police brutality. Erin Logan, the Director of student life told the audience that the college works to address the issue. “We do these at least three times a semester and we call it our ‘excel’ or our ‘coffee and’ series. Excel stands for Excellence in Cultural Education Leadership; it was a program I started four years ago to help with diversity conversations,” she said. “Communication plays an active role in creating positive leaders in the community,” Logan said. Logan spoke about her desire to create a safe place for students to ask questions and have dialogue on hot topics that would cause problems in any other environment.